I read a similar question (Knowing that most students submit assignments right around the deadline, is it advisable not to set deadline that is very late at night?) about setting assignment deadlines at different hours of the day (e.g., 9 AM, noon, 5 PM, 9 PM, midnight). At my institution, we use a learning management system to manage our courses. I require students to use it to submit all of the assignments for the course. I am wondering if it is reasonable to set assignment deadlines on Sunday. On the one hand, I don't want to ruin the weekend for students who may be working on my assignment at the last minute. However, I feel that Sunday deadlines have minimal conflicts with students' other commitments. If for example I were to set the deadline on Monday, students may skip classes to meet my deadline, or they may be busy with work from other classes. Question: Is it unreasonable to set assignment deadlines on Saturday/Sunday, say 6 PM on Sunday? Would this be forcing students to work on the weekends? Don't assume anything about your students' schedules. Set your deadlines so everyone can manage their time based on their own needs. You are concerned about encouraging your students to do work on the weekends. Consider that many students have customer service jobs that require them to work on the weekends (retail, restaurants, etc). They might work nights or swing shifts. They might have children to care for at certain times. You have no way of knowing if doing homework on a Saturday or Sunday is convenient for them or not. Don't arbitrarily pick a deadline based on what you perceive to be best for them. Give your students a full week to work on assignments if you can, because they might only have small chunks of time available to do homework. Make it due when it really needs to be done, such as when the next class starts. For example, I worked 10 PM to 7 AM Thursday through Sunday for my first couple of years in college. I often worked on homework during my lunch breaks, which could be at 2 AM on Monday morning. I'm sure all of my instructors assumed I would/should be sleeping at 2 AM, but it was actually a perfect opportunity to finish up homework. Since there will always be students that procrastinate, and some percentage will inevitably have an emergency at the last moment, you may want to make it clear at the beginning of the course that you are not able to grant any extensions for any reason, because the deadline is already at the last possible moment. Also give the reason why that's the case, whether it's because you will review it in class, or there will be a quiz on it they need to be prepared for, or whatever the reason is. Be clear that since you are already giving extra time, you expect them to manage that time properly, so that an unexpected difficulty does not make their homework late. You can always choose to make exceptions later for truly exceptional circumstances, but having a clear policy that you don't make exceptions will discourage people from taking advantage of your already generous deadlines. I've taken many classes with this policy, and I've never heard anyone complain about it. It's fine. Students are expected to manage their time appropriately. However, one of the things I despise most as a student is when the instructor doesn't finish covering the material needed for the assignment until shortly before it's due. So if, for example, you have a Friday lecture that contains information pertinent to the assignment (other than to answer clarifying questions and such for those who've waited that long), making the assignment due Sunday almost certainly eliminates the possibility of a free weekend. It's absolutely valid to set deadlines on Sunday evening. You do not force the students to work on weekends. This is their own responsibility to manage their workload. They are still allowed to hand in their results on Friday and then they can have a free weekend. One may even argue that a deadline on the weekend gives even greater freedom to the students as they have two additional days. Time management is one ability that is trained while attending university. Students should be allowed to make their own experience. In their future jobs, there will be quite a lot of deadlines such as "until next week" which is also a deadline on Sunday. Is IT support available on Sundays at your university? Is there somewhere students can go or somebody they can call if they run into technical difficulties submitting? If your deadline is, say, noon on Monday or 5pm on Wednesday, then students can get help if they run into trouble. If your deadline is midnight on Sunday, then, on my campus that would mean anybody attempting to submit in the last 55 hours available would be unable to access anything but the out-of-hours hotline. Not only is the existence of this very new, it is of limited help at best. I wouldn't want to be a student relying on this in the face of an imminent deadline. Note that technical issues can affect even the most adept and experienced users of virtual learning environments. A web browser or OS update, some change to the VLE itself can cause problems or some service can go down. Class policies should assume that Sod's Law has special applicability out of business hours. This also depends on the submission method - it sounds like you have an online system in place in this case. Whatever time you set - stick to it (obviously there are some external factors that can change this ie a fire alarm etc).. Allow the students as long as you possibly can from when they have all required information for the assignment to when it must be turned in. The turn in time should be based on when you need to start grading in order to return the assignments when you plan to do so. Every student has their own life, schedule, work commitments, classes etc. A narrow window that is fine for one student may be very inconvenient for others. Making the window as wide as possible increases the chances that every student will have an opportunity to concentrate on your assignment, and get the most benefit from it. Making the window narrower than necessary will lead to some students trying to do the assignment during a work lunch break, or cutting into their sleep time. The students who choose to leave each assignment until just before its deadline are not your problem. They are adults making a sub-optimal choice. Look after the students who are doing their best with time management, but may not have a free hour until Saturday afternoon. It is reasonable to set deadlines on Sunday night or the like. I've had midnight Sunday deadlines for quizzes and assignments (in math & computing) for about 8 years now; the last lecture each week occurs on Wednesday or Thursday. I've only had one or two student complaints in that time (those from students also holding a full-time job through the weekend). I almost always manage to grade them all in the 10 PM - 1 AM zone Sunday night, so I can turnaround with feedback immediately at the start of Monday. Works well for me. Edit: A comment by Mehdrad got me curious as to the exact distribution of submission times leading up to the end of Sunday. 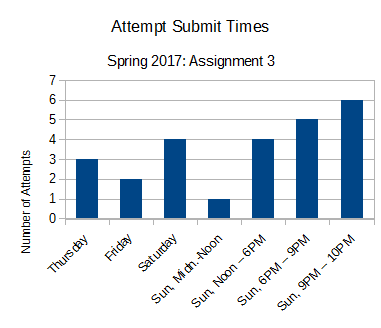 Below is a chart for one introductory programming assignment from Spring 2017 (N = 25), when I temporarily set the cutoff for 10 PM (thinking that I needed extra time to grade the submissions). In this example, about 55% of submissions are made before 6 PM Sunday; 20% come in 6 PM to 9 PM; and 25% come in the last hour (two being within the last possible 2 minutes). Two faulty attempts were submitted on Wednesday (not shown here) and subsequently cancelled/replaced; and another fourteen students submitted nothing. Leaving the assignment at the last minute, especially in order to enjoy the weekend, sounds more like a choice than an obligation. I don't think it's your responsibility to do time and goal management for your students, especially if they are adults. Otherwise I want to agree with Solar Mike, just pick something and stick to it. Your student will manage their time to make things work for them. I don’t think there is anything wrong with that, especially since the submission of the assignment is done online. Saturday and Sunday are only two days. If the students have to sacrifice their weekend to complete the assignment, that is usually because they didn’t manage their time wisely during the days before. Sometimes it's important as a teacher to do things that are unpopular with the students. However, unless there's a good reason otherwise, why not do what the students want? They'll be happier, you'll be happier because they're happier, and you'll get better evaluations. And you can think of this as banking some popularity that you can spend when you need to do something important that's unpopular. In this case I'm pretty confident that the students would prefer a deadline on a weekday, but if you're not confident why not ask them? a number of students may not have access to a computer in order to submit online, at that time. Beware of disadvantaging groups of students that tend to face this restriction. This can be avoided by ensuring sufficient computer availability on campus, which is likely to be true. the times over the weekend may be inconsistent, disrupting regular schedules for some students. In particular this will affect students who have significant work or family commitments while studying that they cannot just "time management" away. This can be avoided by setting every assignment to the same time every time e.g. Sunday at 1700 local. Apart from considerations to ensure all students have an opportunity to meet this submission time, the actual submission time itself is largely irrelevant. Students who are ready earlier can submit earlier or improve their work over the weekend. Students who are not ready earlier will appreciate an educator who doesn't respond to issues in the learner's life with "too bad, you should have been perfect like I want to pretend I was". It seems that your options are to either set a deadline on Friday evening or over the weekend. Let's turn the question around. Suppose you enforced the Friday deadline. Would you actually mark the submitted work over the weekend, or would you wait until Monday? If the answer is that you'd take the weekend off and start marking on Monday, then it's the Friday deadline that's unreasonable. Why would you demand that students hand in work so that you can ignore it for two full days? Set the deadline for Sunday night (or even early Monday morning) and let the students manage their own time. If keeping the weekend work-free is important to them, they'll make sure their work is finished by Friday. Conversely, if you would spend the weekend marking, a Friday deadline would make sense. Whether or not it would make more sense than a Sunday/Monday deadline depends on other factors. However Friday 5pm would be horrible. Considering lectures can run until 6pm, a Friday 5pm deadline is equivalent to a Thursday midnight deadline. Unless you are deadset on marking that evening I don't see why the deadline couldn't be moved to midnight. Would it really make a big difference for you, it sure would to a student, thats a good few hours lost, and making deadlines harder to hit simply because 'students need to learn time management' is a terrible reason. A colleague of mine recently included a question about deadlines in the course evaluation survey. The deadlines for the assignments were set on Saturday at midnight. The students (~40) overwhelmingly commented that deadlines on Saturday were "perfect", "not a problem", "very convenient". Only one student was dissatisfied with having the deadline on Saturday and commented that they would have preferred Sunday! So, at least from the students, it seems there are no objections. Moreover, you are not "forcing" them to work during the weekend, but, by setting a weekend-deadline, you know that many of them will choose to. However, when you set the deadline does not affect the total amount of work: if they choose to work on the assignment during the weekend, they have more time off during the week. Another argument is that you should not be doing time management for your students. While time management is primarily the student's obligation, that doesn't mean that instructors shouldn't consider it. Instructors should design their courses to support student learning, and that means taking students' challenges into account. There seems to be an undercurrent to this argument that procrastination is a form of mental weakness, and making accommodations for it is coddling students. However, procrastination is quite often a result of anxiety or other conditions that should be taken seriously, and not dismissed as merely being character flaws. There are going to be some people for whom dashing off a paper on Friday and turning it in knowing that they did the best they could because that's when the deadline is, is significantly less stressful than having a Sunday deadline and spending the weekend feeling like they "should" be spending the time polishing the paper and worrying whether there's some flaw that they could fix if they just spent more time on it. These are issues that you'll have to weigh. There's no universal answer; I'm not saying that you definitely shouldn't have a Sunday deadlines, I'm just pointing out that there are valid concerns with such a deadline. The only reason I can think of where this would not be "reasonable" is if the students weren't being given ample time to do the assignment. If you were assigning the work on Friday, for example, and asking for it to be due on Sunday, that may not be reasonable. Why not let them have Monday morning to do the work? However, assuming the assignment only takes an hour or so to complete, there should be no problem with assigning something on, say, a Wednesday and having it due Sunday. So long as there is enough lead time, that bit about students potentially procrastinating until Sunday is their problem, not yours. If you assign it on a Wednesday and it's not due until Sunday, it's not your fault if they elect to wait until the last minute just because you gave them extra time. If they don't like doing the work on Sundays, they will learn to carve out some time to get it done before the weekend. One other recommendation I'd make: if there is a good reason for having a six PM Sunday deadline, then share that reason with your students. If I told my class, "I like to look over the homework submissions on Sunday night while I'm preparing my Monday lecture; that way, I can see if there is anything we might need to revisit," I think my students would respect that. It is common for assignment due dates to be specified in the course outline/syllabus. Then the due dates are generally discussed during the first class period or two as the students become acclimated to the course. Since the students know well in advance what is expected of them it is their responsibility to decide when to get things done. It is often wise to avoid changing due dates as this can be surprising for students. The exception to this is to provide additional time to complete the assignment. For example, if the assignment was originally due on Friday but you extend the due date to Sunday night few will complain. However, if the due date was originally Monday and you move it to Sunday night before this could cause problems. Of course, if there was no original due date this does not apply but it would be strange to have no general idea of when you want an assignment submitted when planning a course. I'm sure we all complain if the Dean changes the due date of various administrative task and students are no different. Therefore, it is best to stick to the due dates specified in the course outline (if they are there) or to extend the due date but to avoid moving the due date up. As most others have said, the main thing is: give students enough time to get the assignment done. Given that, no deadline is too bad. Other than that, I think a good deadline should be at or near the "end of working hours" (or at the very start, which basically is the same). Because that maximises the student's capacity for time management. Most of us like to "flow", so planning a full day for a given assignment is normal. And if they need to use the whole last day (not the best idea but still a possibility) allow them. For most people that is at/after sundown. People working nights know they are doing it different and will adjust as usual for them. Just to throw my own two cents' worth in: I like to try to pretend that I won't necessarily demand anything of students (even grad students) outside of some sort of reasonable work-week. Otherwise, I'd feel that I was pretending to command more of their life than I'd really feel I have any right to. So all due dates are "within the work week". Yes, this has implications for due dates that are early in the beginning of the work-week... Regardless of rationalizations about planning... I don't do this. Also, by the way, all due dates are known at least two weeks or so prior, so there's hopefully no abusive creation of conflicts or sacrifices and so on. As a student, and being the few ones that had a good computer at home at the time, I joined a few colleagues and often we did work at night for several reasons. I also had a couple of side jobs in my first few years of University. One of them is that it can get pretty hot in the Summer time, and besides the night silence, you work cooler and focus more at night. For me at the time, an assignment deadline of 0800AM Monday would allow me both to work during the day/or enjoy the beach in Summer time and working towards the assignment during the night. This is probably not a major concern for most of your students, but I mention it because it would have affected me as a student, and it has not yet been addressed by any of the other answers: Some students may belong to religious faiths in which doing work on Saturday or Sunday is prohibited. For example, observant Orthodox Jews and Seventh Day Adventists generally would not do homework from sundown Friday evening until sundown Saturday night. (I am not sure of specific Christian denominations that would have a similar prohibition against working on Sundays, but I have no doubt that they exist.) For such a student, making an assignment due on the weekend neither constitutes extra time nor a temptation to procrastinate; rather, it effectively means that they have one less day to get their work completed than the rest of the class. Now, I don't think faculty should feel obligated to accommodate every student's religious observances -- Sabbath-observant people are used to living in a world that is not designed around our needs. But in the same way that you would probably not schedule an exam on Christmas day or Rosh Hashana, you might want to consider whether weekend deadlines place any of your students under a disadvantage relative to their classmates. Not the answer you're looking for? Browse other questions tagged teaching deadlines or ask your own question. How strict are paper revision deadlines? Why is Hawaii time used for conference deadlines?